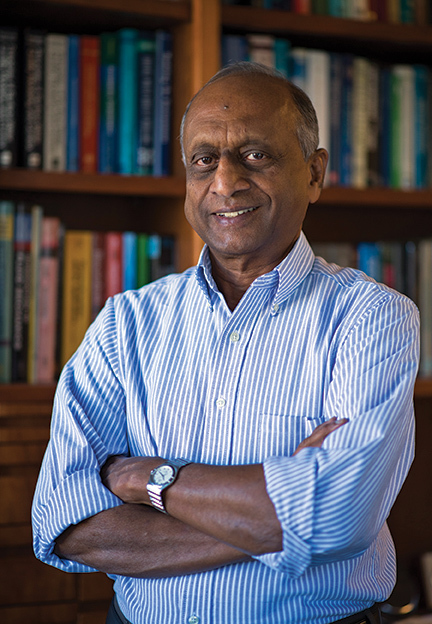 Nagamany Nirmalakhandan, professor of civil engineering at New Mexico State University, was named as the first holder of the Ed and Harold Foreman Endowed Chair in Civil Engineering in 2011. In 2016, this prolific researcher and esteemed teacher received a renewal of that five-year honor, making him the only holder of the chair. Khandan, a member of the NMSU faculty since 1989, has a substantial portfolio of research in environmental engineering to his credit. Most notable are his efforts connected with the Engineering Research Center for Re-Inventing the Nation’s Urban Water Infrastructure (ReNUWIt), a National Science Foundation funded effort with the goal of reinventing America’s aging and inadequate water infrastructure. The multi-university ReNUWIt team is led by Stanford University and includes Colorado School of Mines and University of California, Berkeley. First awarded in 2011, Khandan was named co-principal investigator of ReNUWIt and leader of the center’s work at NMSU. Based on the outcomes during the first five years, ReNUWIt received a second five-year round of NSF funding in 2016. Through ReNUWIt funding to NMSU, Khandan has graduated five Ph.D.s with two more in progress; and graduated 14 master’s degrees with five more in progress. Some 22 community college students, 28 high school students and three high school teachers have also been involved in Khandan’s projects funded by ReNUWIt. Khandan also coordinates a variety of NMSU research projects funded by ReNUWIt and collaborates closely with the other ReNUWIt researchers at NMSU. The collaborative effort garnered this group of ReNUWIt researchers the NMSU University Research Council Team Award for Exceptional Achievements in Creative Scholarly Activity in 2017. “As originally intended, NSF will ramp down funding for ReNUWIt during its last three years, so the goal now is to make it sustainable. We are collaborating among ourselves and with other NMSU colleagues to receive new funding,” said Khandan. Several collaborative projects are being pursued by various faculty members, including Khandan and Pei Xu, civil engineering associate professor. In 2017, they were successful in receiving a major grant from the Bureau of Reclamation to combine their ReNUWIt projects for potable water recovery. “We are working to combine our research to treat wastewater for agricultural, irrigation and potable purposes. Dr. Xu works with membrane technology and I work with algae. We have demonstrated that we can recover very high quality water working together,” said Khandan. It was Khandan’s research with funding from a variety of sources focused on sustainable environmental engineering and renewable energy usage that earned him and NMSU a spot for NMSU as part of the prestigious NSF Engineering Research Center to create ReNUWIt. Khandan received a bachelor’s degree in mechanical engineering from University of Ceylon, Peradeniya, Sri Lanka, and spent 12 years as a mechanical engineer working in the water industry. He came to the United States for graduate school and discovered environmental engineering, earning master’s and doctoral degrees in this field from Drexel University in Philadelphia. His MS/Ph.D. adviser was formerly a professor in the Civil Engineering Department at NMSU and Khandan practically filled his adviser’s former position at NMSU.